The Handbook for realising the rights to water and sanitation: From policy to practice will reflect on general experiences in supporting access to water and sanitation including some of the main challenges of discrimination in service delivery in realizing the rights to water and sanitation. 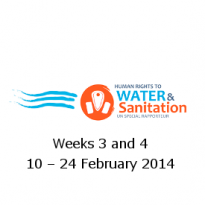 Lessons learned and good practices in addressing discrimination, inequalities and exclusion in accessing water and sanitation services in development programmes, particularly for marginalized individuals and groups, will also be reflected upon. This session will focus on how principles of non-discrimination and equality can be incorporated into legislative, policy and regulatory frameworks and financing for water and sanitation. There will also be a focus on the main challenges to include non-discrimination in an effective and successful way as well as to ensure substantive equality.